« How is Uber Changing Trucking Life? When getting ready to head out on the road, always be sure to have a small checklist of preliminary tasks that will help ensure your safest journey. Years in the trucking industry can definitely lead to helpful experience, but a solid safety routine before venturing off can be your healthiest habit. Prior to hitting the road, wipe your truck’s windshield with a newspaper. This practice may seem a bit odd, but the paper used in newsprint can remove residue on your windshield that could cause dangerous glare during night travel – much more effectively than a basic paper towel or rag. While you’re at it, run both the newspaper and then a clean, dampened cloth over all of your truck’s mirrors. Dirt and residue can cause glares once you’re on the road. If you’re heading out any time after twilight (that dangerous driving window when the sky is not quite light and not quite dark), dim the lights on your dashboard. As the night grows darker, the brightness of all those small lights could impair your vision and cause reflections on your windshield, adding visual difficulty. 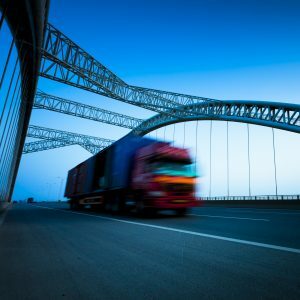 Aside from all of the basic road safety that you’ve learned and put into effect during your time in the trucking industry, a few extra precautions for night driving couldn’t heard. For example, keep your eyes open for wildlife and small animals along the side of the road by spotting the retinas of their eyes. The light from your truck’s headlights will reflect off of the retinas of an animal before it actually comes into view – and this is particularly valuable to keep in mind, as they can dart out in front of you pretty quickly. Before you hit the road, check us out on Facebook, Twitter, Google+, LinkedIn and YouTube. This entry was posted on Monday, April 3rd, 2017 at 8:17 pm	and is filed under Evan Transportation. You can follow any responses to this entry through the RSS 2.0 feed. Both comments and pings are currently closed.